Archbishop Léonard at 75, time to look back and ahead. Today Archbishop André-Joseph Léonard marks his 75th birthday, and his letter of resignation will be delivered to the desk of Archbishop Giacinto Berloco, the Apostolic Nuncio to Belgium, who will forward it to Rome. All this is foreseen in canon law, but the immediate outcome has several options. The resignation may be accepted immediately, after which a Diocesan Administrator will have to be appointed. The resignation may als be postponed for either a set or undefined period. In any case, the Holy See press office bulletins, which announce retirement and new appointments, will be enthusiastically scrutinised. In any case, the relatively short period that Archbishop Léonard occupied the seat of Saint Rumbold is coming to an end. It is a time of looking back, as well as looking ahead. Back at the past five years and ahead to whomever the new archbishop of Mechelen-Brussels may be. Archbishop Léonard was appointed at roughly the same time that I started this blog, and my translation of an earlier interview with him caused one of the first peaks in visitors here. 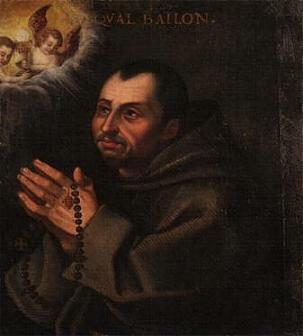 Ever since his appointment, he was considered a likely candidate to be made a cardinal, which however never happened. But this never caused him grief. 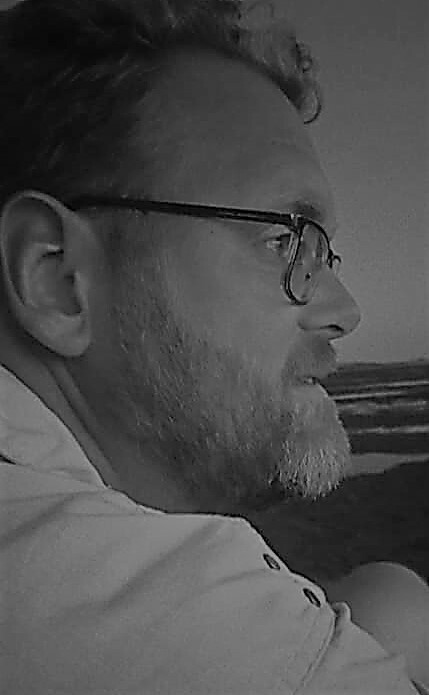 One of the first major obstacles on his path was the revelation that the former bishop of Bruges, Roger Vangheluwe, had been guilty of sexual abuse. As president of the Belgian Bishops’ Conference, all eyes were on Archbishop Léonard. Shortly afterwards, the archbishop went to Rome for the ad limina visit. In an interview he discussed the Vangheluwe case, as well as education and the shortage of priests. Shortly before his own retirement, the archbishop was judged guilty of negligence in a case of sexual abuse. About education, he later had to correct misunderstandings about his comments, something that would mark the following years as well. Notable were his comments about AIDS as a form of immanent justice. This seeming difficulty in understanding between archbishop and media even led to the archbishop’s spokesman resigning. Among many clergy and faithful, even politicians, Archbishop Léonard was not popular because of his clear voice and these misrepresentations, although in pastoral contexts he was widely loved, for example when 22 Belgian children died in a coach crash in Switzerland. Adversity, however, sometimes had the upper hand, as the archbishop was the recipient of pies (above right), pizza, slaps and water to his face. These attacks never aroused anger in him, however. On the contrary. Following that final assault, Archbishop Léonard wrote a very kind letter to all who had expressed support for him. In Brussels, Archbishop Léonard was soon faced with the need for new bishops, as his auxiliaries left to Namur and Bruges. 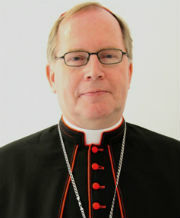 In 2011 he recieved three new auxiliary bishops. In 2012, Archbishop Léonard led his diocese in a new evangelisation of cities, one of the first porjects of the Pontifical Council for the New Evangelisation. Archbishop Léonard took part on two Synod of Bishops assemblies, where he spoke on the reality of evil, as well as the role of women in the Church. In the 2012 Synod he was a member of the Commission for the Message. Following the election of Pope Francis, Archbishop Léonard offered a Mass of thanksgiving in Brussels. Last year, Archbishop Lëonard started looking ahead to the future, even clearing up some misconceptions about his upcoming retirement. After his retirement, and contrary to his previously expressed wish to leave Brussels, Archbishop Léonard will live with the Fraternity of the Holy Apostles, a priestly fraternity which he founded in 2013 (at left, Archbishop Léonard is seen ordaining one of the fraternity’s priests in October of 2014). Priests from this fraternity, inspired by Fr. Michel-Marie Zanotti-Sorkine, are currently entrusted with the pastoral care of two parishes in Brussels. Whether this will be a temporary arrangement or otherwise, remains to be seen. As for the future for Mechelen-Brussels, we can only guess. But there are some possibilities we may investigate. The metropolitan see of Mechelen has been held in turn by archbishops from the Flemish and Walloon parts of Belgium. While Pope Francis, who makes the final appointment, is probably not one to be bothered overly much by such considerations, preferring to choose the best man for the job, whether he be from Flanders of Wallonia, it is a sensitive issue in Belgium. I expect therefore that the new archbishop will come from one of the Flemish dioceses or that part of the archdiocese which lies in Flanders. Archbishop Léonard, after all, is a Walloon, and his predecessor, Cardinal Godfried Danneels, hails from Flanders. The Holy Father may choose to elevate one of the suffragan bishops of Flanders. These are Bishop Jozef de Kesel of Bruges, Luc van Looy of Ghent, Johan Bonny of Antwerp and Patrick Hoogmartens of Hasselt. Bishop Léon Lemmens, auxiliary bishop for the Flemish part of Mechelen-Brussels, and Jean Kockerols, auxiliary for Brussels (pictured at right), may also be added to this group. At 73, Bishop van Looy is too close to his own retirement to be a likely choice. The others are between 56 and 67, so their age is no issue. Three bishops (De Kesel, Lemmens and Kockerols) know the archdiocese well, as they serve or have served as auxiliary bishops in it. There are also bishops who are no strangers to Rome or to the Pope personally. Bishop van Looy accompanied the young people of Verse Vis when they interviewed the Pope last year. Bishop Lemmens worked in Rome before being appointed as auxiliary bishop and Bishop Kockerols is internationally active as one of the vice-presidents of the Commission of the Bishops’ Conferences of the European Union (COMECE). Bishop Bonny had made headlines for himself in relation to the Synod of Bishops, so he will also not be unknown in Rome. 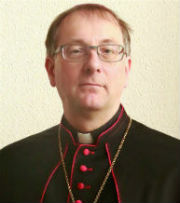 The only relatively unknown bishop is Patrick Hoogmartens, but he, at least, has a motto that should appeal to the current papacy: “Non ut iudicet, sed ut salvetur” (Not to judge, but to save, John 3:17). Or the Pope may decide to do something that hasn’t happened since 1925: appoint a priest who has not yet been a bishop anywhere else to become the new archbishop. Whoever he may turn out to be, he will facing a stiff task as a shepherd in an increasingly secular environment. It may be hoped that he will be both pastorally sensitive and doctrinally clear. Posted on May 6, 2015 May 6, 2015 Categories Catholic Church in BelgiumTags abuse, ad limina, aids, archbishop andré-joseph léonard, archbishop giacinto berloco, archdiocese of mechlin-brussels, belgian bishops' conference, bishop jean kockerols, bishop johan bonny, bishop jozef de kesel, bishop léon lemmens, bishop lucas van looy, bishop patrick hoogmartens, blog, canon law, comece, consistory, diocese of bruges, diocese of namur, education, father michel-marie zanotti-sorkine, fraternity of the holy apostles, godfried cardinal danneels, gospel of john, jürgen mettepenningen, justice, mass, media, pontifical council for the new evangelisation, pope francis, priesthood, roger vangheluwe, synod of bishops, translation, verse vis1 Comment on Archbishop Léonard at 75, time to look back and ahead.